The Embraer Phenom 300 range is one of the best in the light jet category. Embraer was able to go above it's initial Embraer Phenom 300 range projection of 1,800 nautical miles. 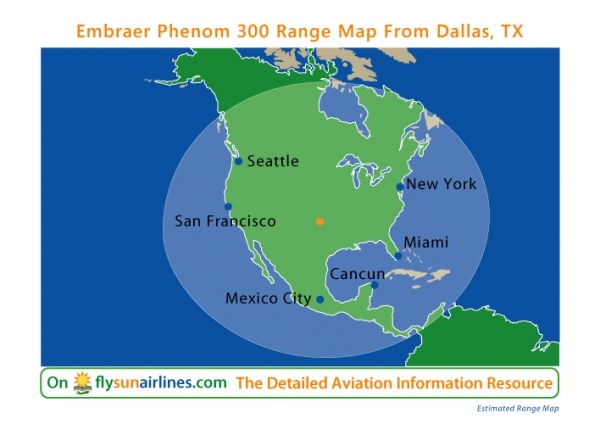 The Embraer Phenom 300 Range is 1,971 nautical miles or 3,650 kilometers when flying at long range cruise speed, NBAA IFR 100 nautical mile reserves and 6 occupants each weighing an average of 200 pounds. Phenom 300 Range: 1,971 nautical miles, 2,268 statute miles (road miles) or 3,650 kilometers (LRC, NBAA IFR Reserves, 6 occupants). For reference: The Embraer Phenom 300 Range is also known as the E55P Range, Embraer 300 Range, Phenom 300 Range, EMB-505 Range, Embraer 300 Phenom Range, Phenom Jet Range, Phenom 300 Jet Range, Embraer Phenom 300 light jet Range, Embraer Phenom 300 airplane Range, Embraer Phenom 300 aircraft Range and the Embraer Phenom 300 Business Jet.